Five tasty C’s: coriander seeds, cumin, curcuma longa (turmeric), cardamom and cayenne pepper! 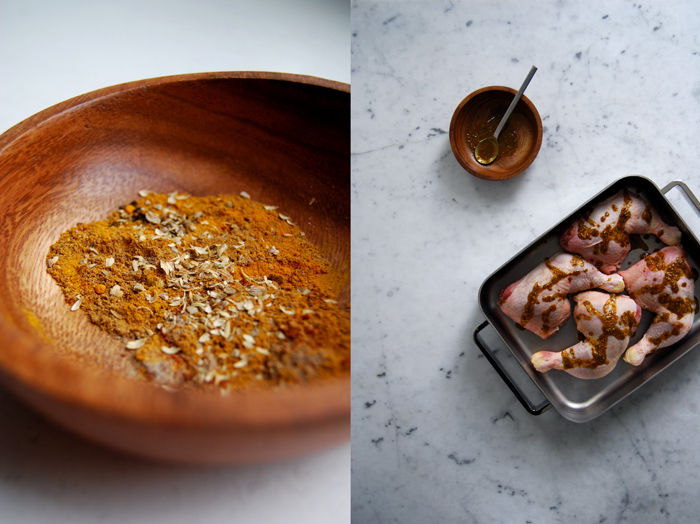 The list of spices for my roast chicken legs is long but each single one adds its strong character to the aromatic result. 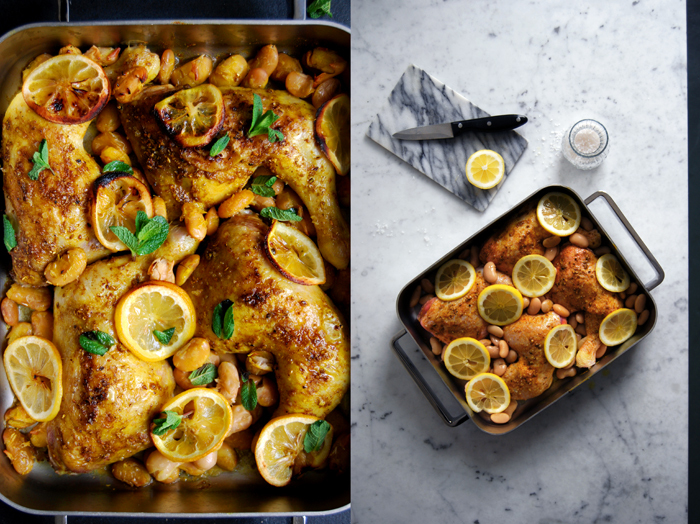 I mixed a generous amount of their fragrant qualities into a golden marinade made of olive oil and lemon juice to let them infuse the chicken’s sizzling skin while cooking in the oven. The air in the kitchen smelled just wonderful and so did the meat when I put the tray onto the table. I also cooked some slices of lemon and butter beans in the spiced oil, the legumes skin burst and their velvety, soft inside mixed with the juices. It literally asked to be soaked with fresh ciabatta bread! My mother often makes chicken legs in larger quantities when she has many people staying at her house, when my cousins visit to help her in the garden, or when her grandchildren visit and she isn’t up for an extensive dinner. 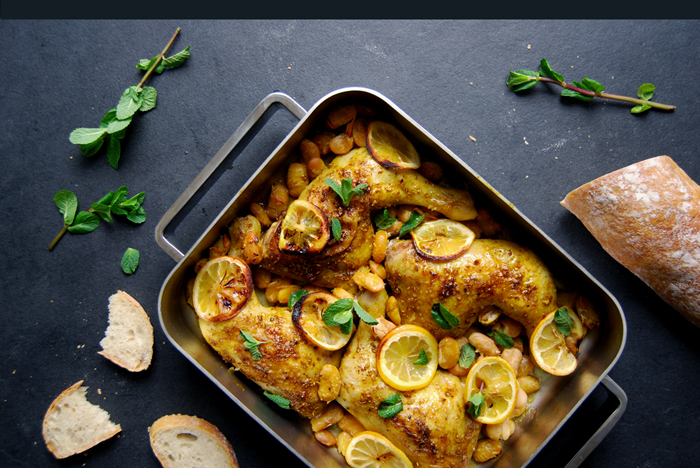 I completely understand why, this dish is the ultimate comfort food, it’s easy to prepare (all you have to do is put the chicken legs on a tray and cook them in the oven) and you can easily customize the recipe. In late summer I cooked chicken legs with Moscato wine, grapes and thyme and in spring I glazed the skin with honey and roasted the meat with carrots and sage. You could also adjust my chicken with spiced peaches and work with the legs instead of the whole bird and enjoy the fruit’s sweetness together with the tender poultry. There are so many options! Sometimes my mother just cooks it with olive oil, salt, pepper and garlic, plain and simple. Just the idea of sitting in her garden eating the chicken leg with my fingers makes my mouth water! Whisk 3 tablespoons of olive oil with the lemon juice and spices. 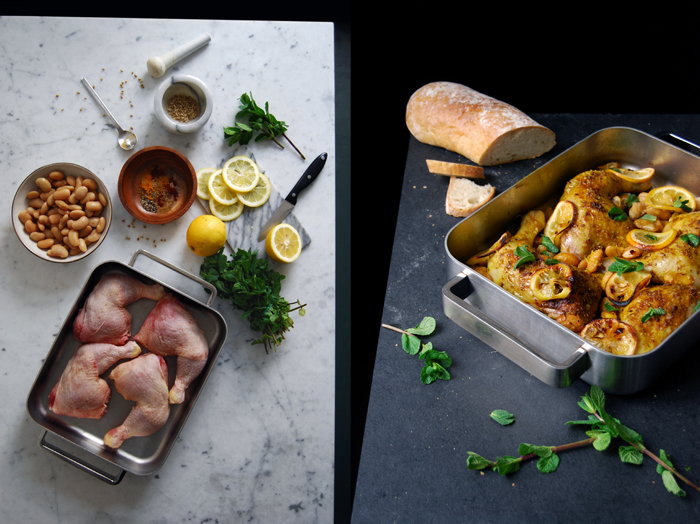 Arrange the chicken legs in a baking dish, rub them on all sides with the spiced oil and sprinkle the skin generously with sea salt. Mix the beans with a splash of olive oil and arrange them around the meat. 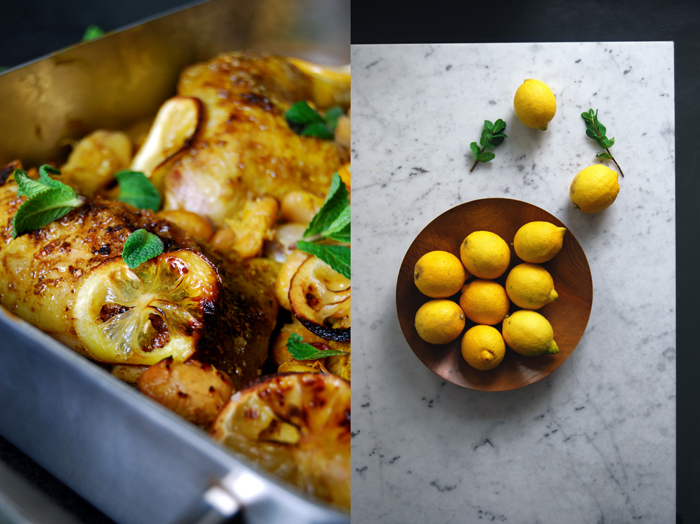 Put the slices of lemon on top and cook in the oven for about 20 minutes or until golden brown. Pour some of the juices over the meat a couple times while it’s cooking. Check the meat with a skewer, only clear juices should come out when it’s done. If you like, turn the grill on for a few minutes until the skin starts sizzling. 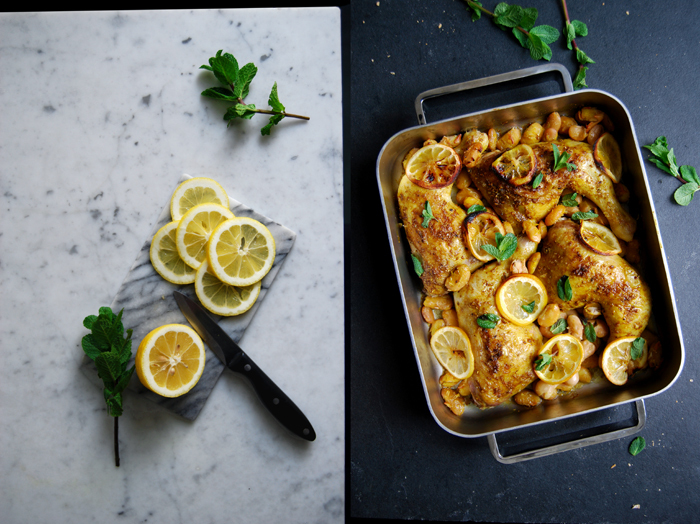 Serve with fresh mint and ciabatta bread. simple crowd-pleasing recipe + many suggestions + a sweet mother memory = perfection. 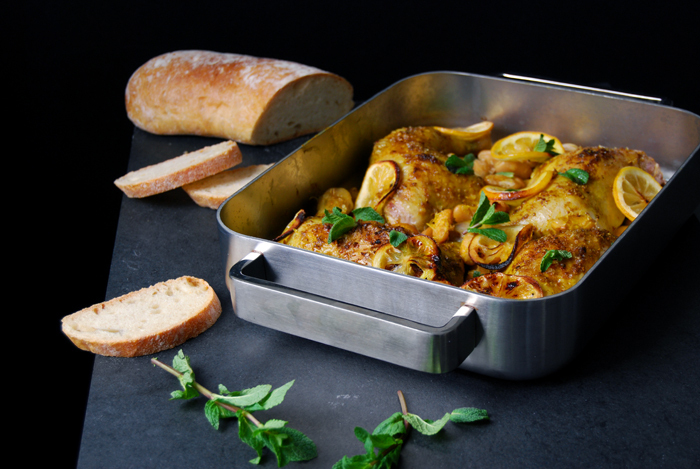 This sounds wonderful – I’m always looking for new ideas for chicken and the flavours in this are perfect. Can’t wait to make this!